Houses & Homes VA: This is AMAZING, CREEPY and TRUE! This is AMAZING, CREEPY and TRUE! I wonder, have you heard about this before? 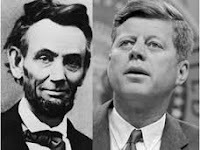 I have read about certain similarities between Abraham Lincoln and John F. Kennedy before but nothing as detailed as what I have listed below. To the best of my knowledge these things are true. In fact, if only half of these things were true it would still be amazing! If you haven’t read anything about the similarities between Presidents Kennedy and Lincoln, this is a MUST READ. This is a bit long winded but it is definitely worth reading. How can this be possible? - Lincoln had 2 sons named Robert and Edward. Edward died young and Robert lived on.